We wanted a life less ordinary. We emigrated to Canada where we lived for three wonderful years before being lured, as all Brits eventually are, to the sun-kissed shores of Sydney, Australia – my wife’s former home. Nothing could have fully prepared us for such a monumental move and there were challenges that we didn’t anticipate and lessons learned that I try to pass on. Before moving to Australia, we researched the areas we might call home and we planned for our far-flung move. Upon arrival, we quickly realised there was so much we hadn’t fully understood. House prices were higher than expected and the job market wasn’t performing the way we’d hoped. With hindsight, planning and on-the-ground knowledge gained through a fact-finding visit were essential for this kind of major move. Sydney is one of the world’s most expensive cities to live in and the cost of living has been a challenging experience. We’ve had to budget carefully and live within our means rather than keep up with the Jones’. Yet we weigh the financial cost against the advantage of living in this beautiful destination and, ultimately, Sydney always wins out. I’d often felt that life in the UK was pricey but after moving to Sydney, it became apparent we’d have to dig deep to ensure we could afford the lifestyle we’d dreamed of. It’s easy to underestimate the impact of leaving everyone and everything you know. Yet you still do it because it’s what you signed up for. In those early years, we missed familiarity and we mourned those we’d left behind. The move abroad put stress on family relationships and those first few years were tough. But we soon accepted we’d made the decision to leave and we had to believe in that decision, ditch the guilt, and find peace with where we now called home or face a future of uncertainty and unease. An important thing I’ve learned about living abroad is the need to fit in with the local community, neighbours and immediate environment. When I’ve moved somewhere and kept to myself, I’ve struggled to connect. My wife is Australian so it was easy to make friends when we first arrived. We already had family and friends here, which was a great support in those early years. But, as time went by, it was vital that I put myself out there and do what I could to engage with my new hosts and potential new friends. The distance from the UK is a frustrating but unavoidable aspect to life in Australia. I’m confortable with time differences and I avoid the potential to disconnect from loved ones by using social media to its full capability (Facebook, Twitter and, of course, Skype). But it’s expensive to return to England on a regular basis and the cost of travel at popular times like Christmas is often exorbitantly high. It comes with the territory and is the price to pay for choosing a life abroad. No one ever said living abroad was going to be easy but it’s safe to say the rewards far outweigh the reverse. Thanks for sharing with us Russell. 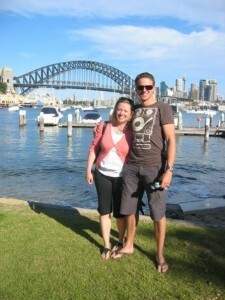 Russell is a blogger and business writer living on Sydney’s Northern Beaches and sharing his efforts at living a life less ordinary at www.insearchofalifelessordinary.com, one of Australia’s leading expat and travel blogs. He can also be followed on Twitter and Instagram as @russellvjward.